Canadian carrier WestJet is embarking on a CAD100 million (USD100 million) cost improvement programme to combat some of the cost challenges that a 17-year old carrier inevitably faces. The scheme is aimed at widening a shrinking cost advantage WestJet holds over its domestic rival Air Canada and ensuring its costs remain competitive with US low-cost carriers that operate in a number of WestJet’s transborder markets. But even as the carrier faces mounting cost pressures, WestJet continues to post solid financial results. Between 2008 and 2012 WestJet’s unit costs excluding fuel and profit sharing increased 10%, and from 2011 to 2012 those cost increased 3%. The year-over-year rise from 2011 to 2012 was in line with WestJet’s projections of a 3% to 3.5% increase, and was largely due to rising airport costs, and increases in marketing and general and administration expenses; however, unit cost increases were recorded across all expense line items. 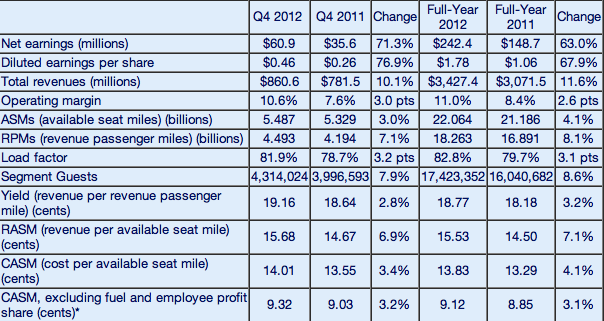 WestJet during 2012 twice revised its unit cost guidance for the year. Originally the carrier forecasted a 1% rise in ex-item (fuel and profit sharing) unit costs, and later revised its estimates to a 1.5% to 2.5% increase. As the year progressed, the estimate was adjusted further to a wider rise of 3% to 3.5%. WestJet throughout 2012 was making investments in IT upgrades and developing plans for its new regional subsidiary Encore, set to debut in 2H2013 with the first two of 20 new Bombardier Q400 aircraft the carrier has on order. WestJet has maintained that costs from certain investments will result in favourable margin expansion in the long-term. Some of the investment directly tied to margin expansion includes an aircraft reconfiguration project to support a new premium economy product set for 2Q2013. In an attempt to stymie some of the cost creep WestJet has recorded during the last few years, carrier CEO Gregg Saretsky declared to investors during a 4Q2012 earnings discussion the airline’s plans to deliver CAD100 million (USD100 million) in cost improvements over a 36-month time period. Mr Saretsky recently commented on the importance of WestJet increasing its cost advantage over Air Canada, which has fallen to about 15% from a historical high of 30%. For the 9M ending 30-Sep-2012 Air Canada’s unit costs excluding fuel increased 2% to CAD11.6 cents while WestJet recorded a 3% increase to CAD9.1 cents. Even though WestJet’s unit costs excluding fuel and profit sharing grew at a faster clip, Air Canada’s unit costs were still 24% higher for the first nine months of 2012. (Air Canada reports full-year 2012 results on 07-Feb-2013). WestJet’s CEO stated another reason the carrier declared a cost reduction target was to ensure the carrier maintained a cost advantage “against all the carriers with whom we compete, including some lower-cost transborder carriers that are increasing service to Canada”. None of the US lower fare carriers such as Southwest, JetBlue or Virgin America have plans to launch flights to Canada given the challenges that higher airport costs create in serving the country. Virgin America served Toronto for a brief time in 2010-2011 from its San Francisco and Los Angeles bases, but ended service due to high operating costs. US ultra low-cost carriers Spirit Airlines and Allegiant Air target Canadian customers by serving US airports just across the Canadian border. Spirit offers flights from Plattsburgh, New York (103km from Montreal) to the leisure spots of Fort Lauderdale, Las Vegas, Tampa and Orlando. Allegiant operates service from Bellingham, Washington (82km from Vancouver) offering flights to Phoenix Mesa, Honolulu, Maui, Palm Springs, Oakland and San Diego. WestJet offers flights to all those destinations from its Canadian network, which could result in its fares being pressured by the ability of those airlines to offer lower base fares given their lower operating costs. Even if WestJet feels slight pressure from the ultra low-cost carriers serving transborder airports, its yields remain strong, growing 2.8% during 4Q2012 and 3.2% year-over-year during 2012. Presently, WestJet is not seeing any deceleration in demand or yield, said Mr Saretsky, noting there is no guest resistance to higher fares. Mr Saretsky stated that by declaring a 36-month timeframe to achieve its cost improvement targets WestJet would be “smart and pensive” with respect to pairing down costs rather than “ripping things out” to reach the benefit in 2013. The major tenets in WestJet’s cost improvement scheme include, examining ways to streamline distribution costs to drive consumers directly to its website; looking at its fleet as potential opportunities arise to replace Boeing 737-700s with larger gauge aircraft; examining employee productivity and the numbers of part-time and full-time staff; and replacing manual back office functions with automated technology. WestJet will not use involuntary employee furloughs to achieve its cost targets, but will consider launching voluntary early retirement incentives. As WestJet considers how to squeeze CAD100 million (USD100 million) in cost savings from its business, another 2% to 3% rise in unit costs is forecast for 2013 as the carrier evolves its business model through the launch of Encore, new fare bundles and a premium economy product. The carrier is declining to offer a long-term unit cost growth estimate pending the outcome of its cost cutting efforts. Despite its cost challenges WestJet continues to post admirable financial results, growing top-line revenues during 4Q2012 by 10% to CAD860 million (USD863 million) and 12% for the full year to CAD3.4 billion (USD3.4 billion). Full-year 2012 expenses jumped 7% to CAD2 billion and 7% for the fourth quarter to CAD769 million (USD771 million). 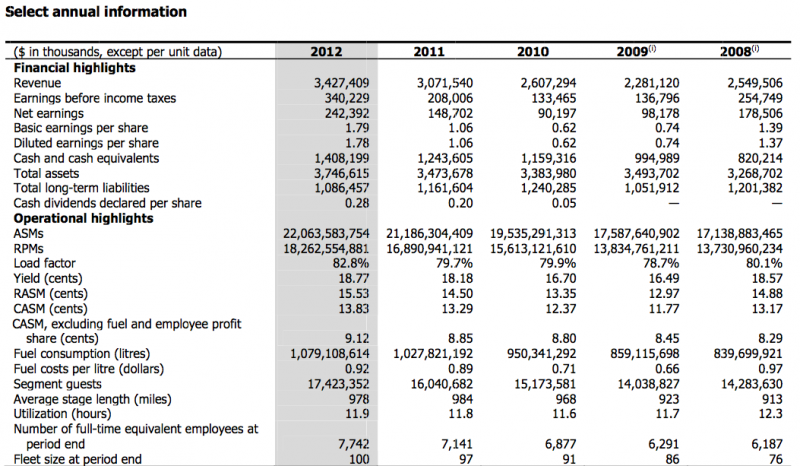 Overall profits for 2012 grew 63% to CAD242 million (USD243 million) and 73% during 4Q2012 to CAD60.9 million (USD61 million). The company’s return on invested capital (ROIC) for the 12 months ending 31-Dec-2012 was 13.7%, which surpassed WestJet’s stated 12% goal. It also performed above target during 3Q2012 when its ROIC for the trailing 12 months was 12.7%. Asked if WestJet would consider upping its ROIC target, Mr Saretsky concluded that the carrier has exceeded its goal for only two quarters. Once WestJet can consistently beat those targets, it will mull raising the bar, he stated. WestJet marks a significant milestone on 11-Feb-2013 when it unveils the initial routes to be operated by the first two 78-seat Q400 turboprops under the Encore brand after those aircraft are delivered in Jun-2013. The carrier’s entry into the regional space marks a significant evolution in its model, which has been maturing during the last few years. A cost creep has coincided with WestJet’s evolution from a pure low-cost carrier to a hybridised airline that has a major focus on increasing its corporate share. The carrier should be recognised for its attempts to stave off rising costs, but only time will tell if WestJet’s business diversification will be successful in generating enough revenue to combat its ever-increasing costs.